Which John is the Author of Revelation? From where does the contemporary idea of a Revived Roman Empire come? Why do the vast majority of Bible scholars substitute kingdoms for kings in Revelation Chapter 17? Why is it that most teachers and students of Scripture adamantly maintain that only the Apostle John could have written the book of Revelation? How could so many students of Bible prophecy (including me at one time) miss the stunning evidence clearly conveyed in Revelation? “The beast you saw was once alive but isn’t now…” (Revelation 17:7). My second book (Out of the Abyss … can the number of the beast be solved? 666, published in 2011) originated directly from the dramatic discernment given to me in November, 2008 regarding the staggering implications of this passage. Subsequently, several Eye of Prophecy articles have expounded on the above quoted verse and several other Biblical passages to affirm the identity of Antichrist—none other than the Roman Emperor, Nero. But not to reinforce the misguided view of the Preterists who also point to Nero as the Antichrist. Because the Preterist maintain that the Great Tribulation occurred in the first century; which any number of Bible scholars have robustly refuted with clear Scriptural and historical documentation. As I’ve stated before, with abundant reasons given, the simple fact remains that the Great Tribulation is yet to come, preceded immediately by the Rapture, which unequivocally undermines the unscriptural and illogical premise advanced by the Preterists. Yes, Nero was the Antichrist of the first century. But what the Preterists missed entirely is the astonishing disclosure in Revelation 17: the Antichrist had already lived and died BEFORE John saw this man in the form of a beast … as just quoted in the above verse. The few who believe that Nero was the Antichrist, do so primarily because the number of the beast through gematria (six hundred, sixty-six) corresponds to the name of Nero. Which it does, but that’s only one of many prophetic passages in Scripture that match Nero to Antichrist; some coming to pass in the first century, but most to be fulfilled during the Great Tribulation soon to come when Nero reappears from the Abyss. Just as clearly and convincingly in this same passage, the angel who is revealing the mystery of the beast to John goes on to say that the Antichrist beast (who had already lived and died) would then, “…come up out of the bottomless pit…” And that the world (those left behind at the Rapture), “…will be amazed at the reappearance of this beast who had died” (Revelation 17:8). This mind boggling fact was completely missed by the Preterists. But the same Bible scholars who astutely disproved the inaccurate claim by the Preterist that the Tribulation took place in the first century have also thrown out the baby with the bath water. Although I don’t like the analogy of comparing Nero to a baby, nearly all (if not all) students of prophecy have dismissed Nero as the Antichrist because the Tribulation has not yet taken place. Thereby, missing the extraordinary evidence in Revelation 17 that the Antichrist beast (Nero) will have reappeared from the Abyss when he arrives on the Tribulation scene. Lived and died before John saw him (the beast) arise from the Sea (Abyss), thus the Antichrist could not be a modern-day born man (Revelation 13 & 17); the ruler who would arise shortly after Messiah was killed, whose armies would destroy the Temple (Daniel 9:26, 27); Nero was the man of lawlessness and the restrainer was the Roman Government and Claudius Caesar, not the Holy Spirit (II Thessalonians 2); suddenly (not gradually as would a modern-day born man) reappearing to the post-Rapture world (Daniel 7, Revelation 13 & 17); one of, out of, and from the seven kings who are seven Roman Emperors of the 1st century and not kingdoms as proposed by most Bible scholars (Revelation 17); and other passages. In next week’s article we’ll see more compelling evidence to demonstrate that the beast/king of Revelation (Antichrist) was certainly known by the first century and subsequent century Christians to be a Roman Emperor … Nero Caesar. 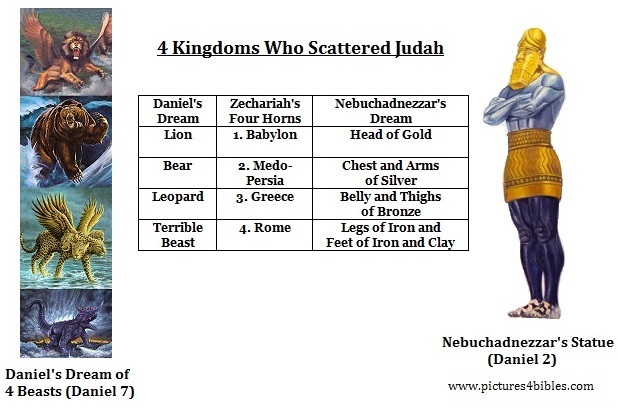 That there were seven Roman emperors who matched the seven kings of Revelation 17. But first, in this week’s article, we need to examine evidence as to which John wrote the book of Revelation, as this issue is a formidable obstacle to correctly understanding that there were, in fact, seven kings (Roman Emperors) and not ten or more. Returning to the questions that opened today’s article, answers will be given this week and next regarding the two reasons why students of prophecy replaced seven kings with seven kingdoms. With the 7th kingdom purported to be a Revived Roman Empire instead of the clear textual reference to and meaning of all seven kings as men—by the use of personal pronouns and the Greek word for kings, not kingdoms as found in Revelation Chapter 17. Reason #1: The prevailing view that the book of Revelation was written by the Apostle John in the mid-90s AD, not another John. Reason #2: For reason number one, students of prophecy contend that there would be ten or more kings, not seven; thus, the only alternative for them was to (erroneously) replace the Greek word for king with kingdom. “This calls for a mind with understanding: The seven heads of the beast … also represent seven kings. Five kings have already fallen, the sixth now reigns, and the seventh is yet to come, but his reign will be brief” (Revelation 17:9-10). If you haven’t read Out of the Abyss, what you’re about to discover is that no matter which John (the Apostle or who some call John the Revelator) wrote Revelation, first century history perfectly matches what the angel is telling John in the above quoted verses. We’ll see how that works in next week’s article. Therefore, there’s no reason to change seven kings to kingdoms just because there are ten or more Roman emperors up to the time that John the Apostle may have written Revelation (if he did), which is thought to be around 95 AD. Why can I say that? Because, when we peer into the first century with historical hindsight (20/20 vision), we’ll plainly see that there’s more than one way (retroactively) to positively match what actually happened in the 1st century to what Scripture is telling us. Please understand: The first part of Revelation 17:8, then all of verse 9 and most of verse 10 are not future tense (prophecies). They are, in fact, past and present tense (what had happened and was happening in the Roman Empire at the time), with only a slight future tense reference to the 7th king (Roman Caesar) who hadn’t yet begun his reign when the revelations were given to John. If you’re confused or at least puzzled, that’s not all bad! Because you’re more likely to continue reading both this week’s article (Part I) and next week’s (Part II). There’s nothing like solving a Whodunit mystery! The main reason that Bible scholars have discounted the seven heads as seven kings stems from the difficulty of sequentially selecting these emperors in the context of when John wrote Revelation. Why? The prevailing view ascribes authorship to the apostle John during the reign of Domitian (81 to 96 AD). I will give you both sides to this issue, including compelling evidence to make the following assertion: No matter who wrote Revelation or when it was written, as applied to the five fallen kings, the 6th now reigning, and the 7th to follow with a short reign, Revelation 17 allows both views to fit! (Page 140). In Out of the Abyss I present the reasons that most Bible scholars and teachers insist that John the Apostle wrote Revelation; however, time/space in today’s article doesn’t permit elaboration on those explanations. Unfortunately, however, we cannot stake our theological lives on an unequivocal decree that John the Apostle authored the book of Revelation. I wish I could, as I have always been taught that, and always accepted it without reservation. By far, John (the Apostle) is my favorite choice (page 141). Instead, we’ll look at reasons why the Apostle John may not have been the author; it very well could have been another Christian believer named John to whom Messiah Jesus and angels disclosed the awesome revelations as recorded in the Book of Revelation. John the Apostle is correctly credited with authorship of the Gospel of John and the Epistles I, II, & III John. Although the Apostle John does not identify himself by (the author’s) name, I am in full agreement with all of the evidence to convincingly conclude that he did author these four books of the New Testament. Yet one of the reasons to question the Apostle John’s authorship of Revelation is the very fact that he doesn’t name himself in the above listed books. Whereas, in the book of Revelation, the writer identifies himself no less than four times! Beginning with, “This letter is from John to the seven churches in the province of Asia…” (Revelation 1:4). When you think about it, the author of Revelation naming himself not just once, but four times, is a substantial departure from the Apostle John not identifying himself in his Gospel and Epistles. It is also baffling because the Apostle John would have even less reason to identify himself as the author of Revelation. Why? If he did write Revelation during the reign of Domitian, he was already well-known in Christian circles. Likewise, if the Apostle John wrote Revelation, it would be more logical and consistent to refer to himself as a disciple or as an elder as he did in the Gospel of John and II & III John, respectively. Some scholars cite the substantial differences between the near flawless Greek of John’s Gospel with the more unpolished style and unrefined syntax of the book of Revelation. Their conclusion: these books were not authored by the same man. *Note: this observation must be given serious consideration. Nearly all authors, if not all, maintain the same basic style of writing, even if their works are both fiction and non-fiction. And especially if they are of one genre (non-fiction as is the case with all books of the Bible). Although the Holy Spirit inspired all authors of Scripture, he nevertheless utilized the individual literary talents, traits, and tendencies of each writer. 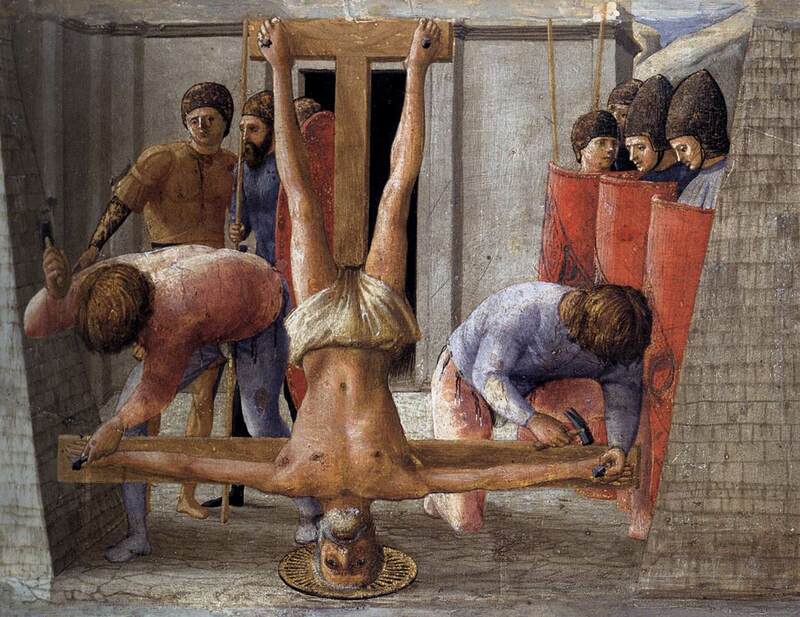 Another primary reason in contending that the Apostle John wrote Revelation (around 95 AD) is the presumption that Christians were more heavily persecuted during the reign of Emperor Diocletian than under any other Caesar. Hence, John the Apostle’s exile to the isle of Patmos. The view that Revelation was written by the apostle John during the 90s AD is still prevalent and predominate despite the indisputable historical evidence that Christians suffered and died much more extensively under Nero (including the execution of the Apostles Paul and Peter during Nero’s reign). My fairly extensive research and preparation for writing Out of the Abyss involved a thorough study of first century history and all Biblical passages on the Antichrist, not the least of which was the book of Revelation. Because authorship of Revelation is one of the main reasons Bible scholars cannot reconcile the number of kings (seven) with the historical number of 1st century Roman Emperors to the time they believe Revelation was written (95 AD), I conducted my own scrutiny of Revelation’s authorship mostly from the text itself. First, as indicated earlier, to emphasize that we really don’t know with concrete certainty who wrote Revelation. Which doesn’t detract in the least from the fact that this book (like the unknown composition of Hebrews or Esther or many of the Psalms) was/is just as powerful and true as any other book of the Bible, whose author is known. Let’s look at seven more reasons why another John may have written Revelation, as developed during my examination of Revelation’s authorship. From the first century down to our 21st century, John has been a common name. As recently as 1923, it was the most common name given to newborn boys. Although slowly declining in popularity (what with the growing number of very unusual names all over the world), in 2015 the name John still ranked 26th in popularity. Hence, the distinct possibility that John of Patmos was other than the Apostle John. Also it’s entirely feasible that both had been exiled to Patmos, perhaps at different times. Where in the New Testament do we find the appellation of Antichrist? I would venture to say that nearly all unbelievers (those who know some of the names of the books of the Bible) but even a great many believers would answer: The term Antichrist is found in the book of Revelation. Is that your answer … Revelation? No, not in Revelation. Antichrist is found in only one book, I John, written by John the Apostle. Yet, most of the Biblical passages about Antichrist are found in Revelation, however, by employing the terms beast and king. The other books of the Bible that refer to this evil man use the designations of little horn, ruler (prince), king in Daniel; man of lawlessness (II Thessalonians 2); worthless (foolish) shepherd (Zachariah 11). (Please see Eye of Prophecy trilogy, A Beast by Any Other Name … Is Still a Beast, posted 3-14, 3-21, & 3-28-15). If John the Apostle wrote Revelation to include two entire chapters (13 & 17) and parts of other chapters on the Antichrist, then why wouldn’t he have used the same term Antichrist that (only) John himself used in his first epistle? That is a question that cannot be brushed aside trivially or glossed over dismissively. You would expect the Apostle John (if he authored Revelation) to utilize the label of Antichrist at least once. But he doesn’t. Whereas, if Revelation was written by another John (who, for example, had not yet read I John or more likely because I John had not yet been written), he would and did refer to the man—called Antichrist by the Apostle—as a beast and a king, which are the descriptions of this tyrant in Revelation. “I, John, am your brother and your partner in suffering and in God’s Kingdom and in the patient endurance to which Jesus calls us. I was exiled to Patmos for preaching the word of God and for my testimony about Jesus” (Revelation 1:9). If not all, then at least the greater majority of 1st century believers—especially while the Apostle John was still alive—would have known beyond any doubt that this beloved apostle was their brother (in Christ) and why he would be suffering (for preaching the Gospel). If the Apostle John wrote Revelation, I suppose it’s possible that he would have cited these reasons perhaps for emphasis; although it was the Apostle Paul and the Apostle Peter who talked much more about suffering for the sake of Messiah Jesus. However, the Apostle John says virtually nothing about suffering for Christ in his epistles and very little in his Gospel. Whereas, another (less well-known or not known at all) John of Revelation would want and need to emphasize to the churches that he was a fellow believer in Messiah. And that’s why he had been exiled to Patmos and why he was being persecuted … because he, too, was a brother and partner in suffering. “When I turned to see who was speaking to me, I saw seven gold lampstands. And standing in the middle of the lampstands was someone like the Son of Man…” (Revelation 1:12-13). Two things caught my attention in this passage: (A) it’s clear that John did not recognize Jesus or didn’t know for certain if the man was the Lord. It’s also evident that John was amazed at the appearance of the man standing before him. Among other descriptions of what he saw: “…And his face was like the sun in all its brilliance” (Revelation 1:16). If John the Apostle wrote Revelation, his amazement at the man’s appearance wouldn’t preclude him from recognizing the man as his risen Savior, Messiah Jesus. (B) Nor would John the Apostle (if he wrote Revelation) have described the person he saw as, “…someone like the Son of Man?” He simply would have said, The Son of Man. I draw that conclusion because the Apostle John knew Jesus as the Son of Man, a term that Jesus used himself to emphasize that he was the Messiah. Whereas, the Apostle John’s definitive emphasis is that Jesus is the Son of God. The prophet Daniel also saw Messiah Jesus, in one of Jesus’s pre-Incarnate appearances. Here’s what Daniel wrote: “As my vision continued that night, I saw someone like a son of man coming with the clouds of heaven…” (Daniel 7:13). The disciple John would certainly have recognized Yeshua, even in his risen and glorified body and despite the glorious description of this man who stood before John. 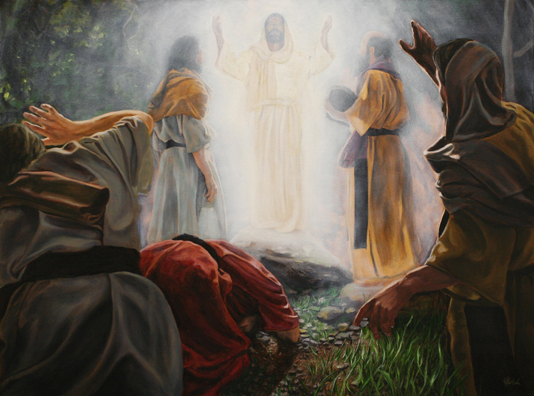 Not only had the apostle John been a constant companion to Jesus for well over three years; he was one of three disciples afforded the wonderful privilege of watching the awesome pre-crucifixion, pre-ascension transfiguration of Jesus (Page 144). In the first chapter of his Gospel, John writes: “So the Word became human and made his home among us. He was full of unfailing love and faithfulness. And we have seen his glory, the glory of the Father’s one and only Son” (John 1:14). The Apostle Peter also wrote about this exceptional experience on the Mount of Transfiguration. “…We saw his majestic splendor with our own eyes when he received honor and glory from God the Father…” (II Peter 1:16-17). Who are the “we” referred to by Peter? You know the answer: Peter, James, and John! “…Don’t be afraid! I am the First and the Last. I am the living one. I died, but look—I am alive forever and ever! And I hold the keys of death and the grave” (Revelation 1:17-18). “In the beginning was the Word, and the Word was with God, and the Word was God” (John 1:1, NASB). Jesus would know that John the Apostle needed no reminder or assurance that he (Christ) had died, was now alive, and would live forever. To the contrary, it would be completely plausible for Jesus to triumphantly declare, reinforce, reestablish, and otherwise bolster this tremendous truth to a man who had trusted Christ as Savior, but had never seen Christ before. It’s much like the touching scene (a small pun intended), in which Jesus invites the apostle Thomas to touch the nail imprints in his hands and feet, and the spear print in his side. Jesus effectively told Thomas: You followed me, you believed in me, but to eliminate all doubt, touch the wounds. How did Thomas respond? By proclaiming, “My Lord and my God!” And where is this passage in the Bible found! It is recorded in the 20th Chapter of the Gospel of John! The apostle John witnessed this poignant scene, one that I’m sure he would never forget. It’s entirely sensible that we have another John, a believer, like many believers who have never seen Jesus, needed these words from Messiah to reinforce the undeniable, everlasting truth that Jesus is alive. He has risen! He has risen, indeed! (Out of the Abyss, page 146). Let’s look at another incident, which actually occurred twice during the astonishing revelations given to John. If just these incidents were the only passages, they alone would provide persuasive evidence to suggest that another John (not the Apostle) was selected by Jesus to write the book of Revelation under the inspiration of the Holy Spirit. But when combined with the reasons already given … well, you decide. There are three sources of the revelations given to John: (A) Jesus, himself; (B) viewing what is taking place as a bystander; (C) from angels. Most of the revelations are from angels, including the dramatic disclosure in Revelation 17 of the woman (city of Rome, which later morphed into the Holy Roman Empire … now headquartered in the Vatican) and the geopolitical and biographical origin of the beast (Antichrist). “Then I fell down at his feet to worship him, but he said, ‘No, don’t worship me. I am a servant of God, just like you and your brothers and sisters who testify about their faith in Jesus. Worship only God. For the essence of prophecy is to give a clear witness for Jesus’” (Revelation 19:10). Just as the Apostle John would have recognized Jesus in the opening scene on Patmos and just as the Apostle (he if was the John of Revelation) would not need to be told—either for the first time or even as a reminder—that Jesus had died and rose again, I’m firmly convinced that the Apostle John would not have fallen at the feet of the angel, let alone worshipped the angel. 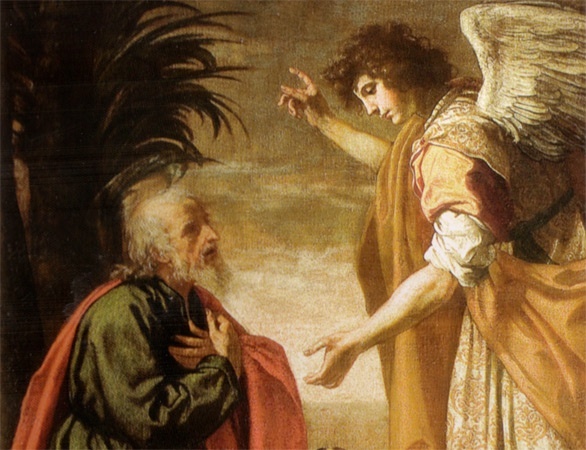 In fact, as amazing as the scene John had just witnessed in heaven and as splendid as God’s angels are in appearance and power (given to them by their Creator), he more than all of the apostles would have known better than to worship an angel. He would have clearly comprehended that you don’t worship the angelic messenger; you worship the King who sent the emissary. “I, John, am the one who heard and saw all these things. And when I heard and saw them, I fell down to worship at the feet of the angel who showed them to me. But he said, ‘No, don’t worship me. I am a servant of God, just like you and your brothers the prophets, as well as all who obey what is written in this book. Worship only God!’” (Revelation 22:8-9). Even if the apostle John had been caught up in the splendor of the moment the first time he fell at the angel’s feet, would he have made the same mistake twice? Anything’s possible, but my guess is that the consensus answer would be a resounding, “No way” (page 147). This conclusion is even stronger considering that the Apostle John would have been much older and more mature during the time Revelation was written than he had been as a young man (disciple) when Jesus was on earth. He wouldn’t have fallen at the angel’s feet even once, let alone twice; as he might have done as an impetuous young man who (along with his brother, the Apostle James) persuaded his mother to ask Jesus permission for them to sit on either side of Jesus in the Kingdom of God! 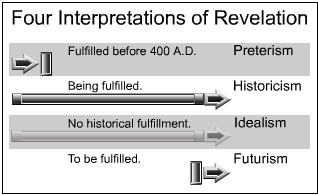 Before we look at one last reason in this study of the authorship of Revelation, I need to reemphasize that next week’s article will provide captivating confirmation to show that no matter whether the Apostle John or another John wrote Revelation and when it was written, the succession of seven Roman emperors still fits. This fit will, in turn, prove that the Antichrist (who had already lived and died before John wrote Revelation) was one of the seven kings of Revelation 17. Consequently, there was no need for Bible scholars to substitute seven kings with seven kingdoms because they couldn’t reconcile the number of Roman emperors. Or to maintain this hypothesis because of their contention that Revelation was written by John the Apostle around 95 AD. (7) Was John of Revelation an (the) Apostle or a Prophet? By the sheer number of prophetic revelations given to John (of Revelation), it’s obvious that he was a Prophet. Though the majority of prophets in Scripture lived in Old Testament times, there were some believers in the first century who had been called by God to be prophets. Even though both Paul and Peter had been given a couple of prophetic revelations, their commission and function was that of an apostle. Likewise with the Apostle John and all the apostles. Then Paul asks a rhetorical question: “Are we all apostles? Are we all prophets? Are we all teachers? … Of course not!” (Verses 29-30). As such, none of the apostles were prophets, in the sense of being called and designated by the Lord to do the work of a prophet as demonstrated by the Biblical concept, definition, and performance of what a prophet does. In closing, I’ll cite an excerpt from Out of the Abyss that also summarized that particular chapter concerning Revelation’s authorship. I trust that you have accepted this textual exegesis for what it is: a possible alternative to the apostle John as the author of Revelation. One that is not intended to absolutely declare that another John was the author; or to patently prove that John the Apostle did not write Revelation (page 148). To also express my love for my brothers and sisters in Christ and gratitude to the students of prophecy who have correctly put together much of the prophetic puzzle … but not all of it. That was part of my purpose in writing Out of the Abyss as well as many of the Eye of Prophecy articles to date. That purpose is: clarification and correlation. But also correction … to accurately refit some pieces of the prophetic puzzle. In this case to demonstrate that the Antichrist was revealed in the 1st century as the man of lawlessness, and will reappear (return) as the beast of the (21st century) Tribulation. That he is one of the seven kings, specifically one of the five who had died before John wrote Revelation, and that ALL Biblical passages dealing with the Antichrist fit together in amazing fashion. To such an extent, when aligned with first century secular and church history, they show convincingly that Nero matches each and every passage. Some of the passages in Daniel (the little horn, ruler, king), in II Thessalonians 2 (man of lawlessness), and in Revelation 13 & 17 (the beast who had already lived and died) were fulfilled in the 1st century when Nero unlawfully ascended (usurped) the Roman throne as Caesar. Then later the Roman Legions, personally dispatched by Nero, destroyed Jerusalem and the Temple (Daniel 9:27). The remaining prophecies in these same books of the Bible will be completely fulfilled when Nero reappears (returns) as the beast/king of Revelation, called by the Apostle John as the Antichrist in I John. “Why are you so amazed? the angel asked. I will tell you the mystery of this woman and of the beast with seven heads and ten horns on which she sits. The beast you saw was once alive but isn’t now. And yet he will soon (suddenly at any time) come up out of the bottomless pit and go to eternal destruction. And the people who belong to this world … will be amazed at the reappearance of this beast who had died” (Revelation 17:7-8, parenthesis mine). The ultimate goal of Out of the Abyss and some Eye of Prophecy articles is to prepare people now and especially after the Rapture, so they will not be so “amazed” at the reappearance of the beast … Antichrist Nero. Instead, they will be amazed at the accuracy of Scripture and the everlasting truth that Jesus is the Messiah. To then embrace him as Lord and Savior! “But everyone who calls on the name of the Lord will be saved…” (Joel 2:32).